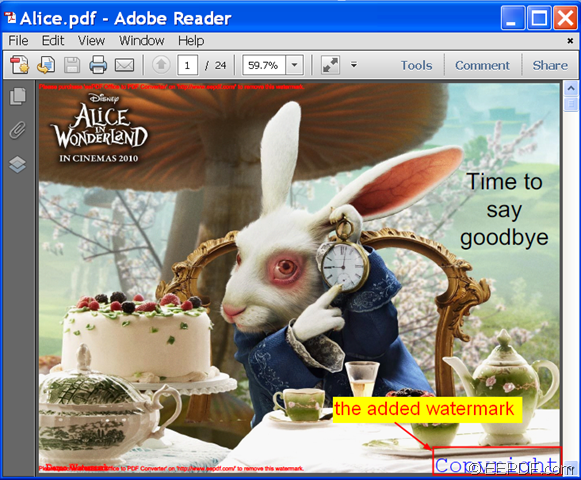 This article is mainly about how to convert Office PowerPoint to PDF and add watermark at right bottom of PDF with the application EEPDF Office to PDF Converter. Portable Document Format (PDF) captures formatting information from a variety of desktop publishing applications, making it possible to send formatted documents and have them appear on the recipient’s monitor or printer as they were intended. EEPDF Office to PDF Converter is a powerful Office tool that can not only convert Office Word to PDF, Office Excel to PDF, Office PowerPoint to PDF, RTF to PDF, etc., but also can convert various image formats including JPG, PNG, BMP, GIF, TIF, TIFF, PCX, TGA, etc. to PDF. 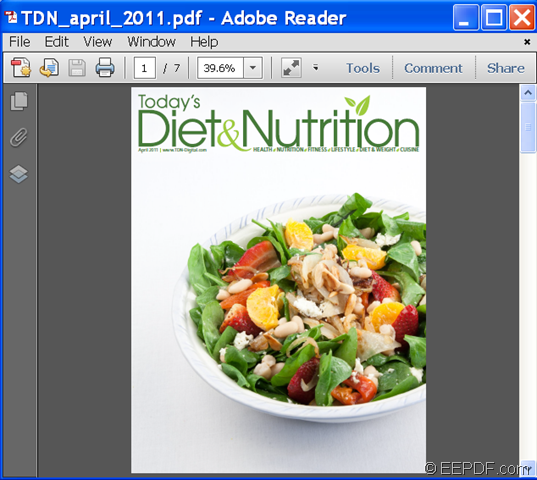 What’s more, you can add watermark to the created PDF. To know how to convert Office PowerPoint to PDF and add watermark at right bottom of the created PDF, please do as follows. 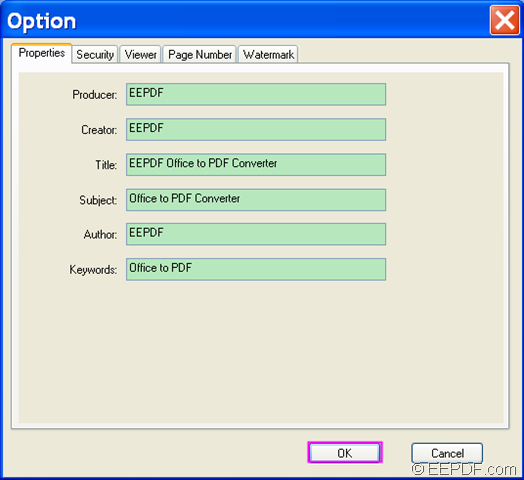 Firstly, please download EEPDF Office to PDF Converter. After the download, please double click the downloaded file and follow the installation steps to install it on the computer. Secondly, please launch this software and add the Office PowerPoint file you want to convert int the processing file list of the application. Click once on the button Add files on the right side of the file list and choose PowerPoint file from the opened file picker window. Please see it in the following snapshot. Thirdly, please click Settings button below the file list to open the “Option” window, and then click the tab Watermark to switch to the “Watermark” panel. 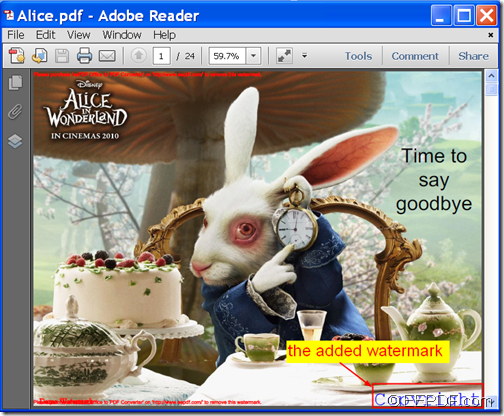 In the “Watermark” edit box, please input the watermark you’d like to add to the PDF file. In the drop-down list of “Position”, please choose “Right bottom”. After that, please remember to click the OK button at bottom of the “Watermark” panel to save the settings and go back to the main interface of this application.Please see it in the next snapshot. Lastly, please click the Convert to PDF And Save As button below the file list on the main interface to start to convert the added Office PowerPoint to PDF. This will generate a “Browse for Folder” saving window, please choose a folder to save the created PDF file. Please see the conversion effects from the following snapshots. 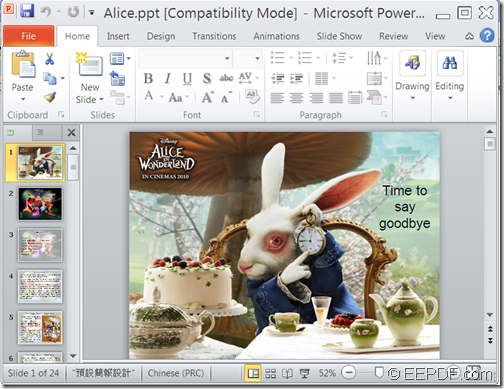 This is the end of this article and you can get the full version of EEPDF Office to PDF Converter here. If you want to create PDF from Office Word and add page number to the created PDF, the application EEPDF Office to PDF Converter will be a good choice for you. PDF (Portable Document Format) is independent of application software, hardware, and operating systems. Each PDF file encapsulates a complete description of a fixed-layout flat document, including the text, fonts, graphics, and other information needed to display it. 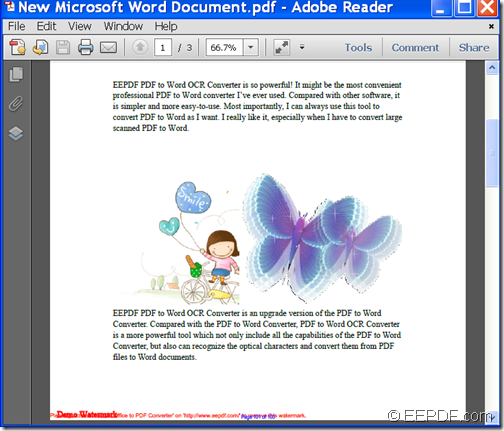 EEPDF Office to PDF Converter can create PDF from various file formats such as Office Word (DOC, DOCX), Office Excel (XLS, XLSX), Office PowerPoint (PPT, PPTX), RTF, image(JPG, JPEG, BMP, PNG, TIF, TIFF, GIF, PCX, TGA, JP2, J2K, JPC, JPX, PBM, PGM, PNM, PPM, PSD),etc. 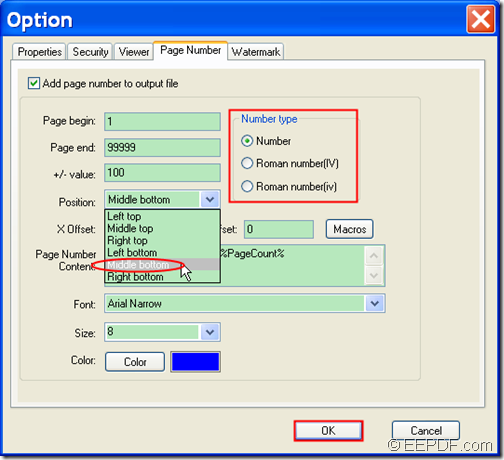 During the conversion it also allows you to add page number for the created PDF. Free download EEPDF Office to PDF Converter and install it on the computer. The following contents will show you how to use this tool to create a PDF file from an Office Word file and add page number at middle bottom of the created PDF. 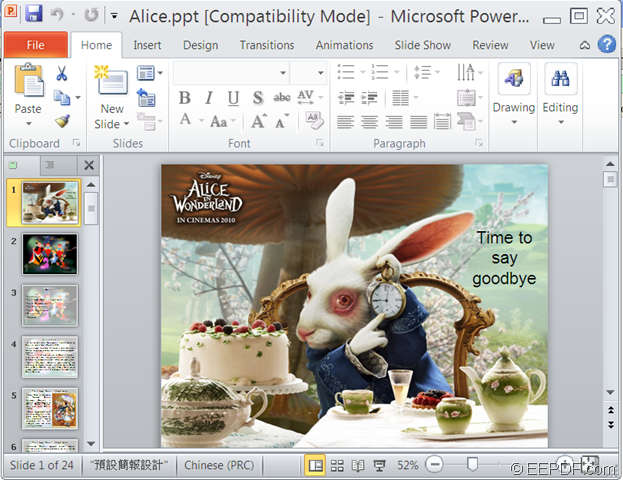 Directly drag and drop the Word file into the application. Click button Add files in the right toolbar of the main interface to open file picker window in which you can choose files. Please see it in the next snapshot. Click button Setting at bottom of the main interface to open the “Option” interface. Click tab Page Number on top of the “Option” interface to switch to the “Page Number” panel. Choose a number type in the group box of “Number type”. Select the item “Middle bottom” in the drop-down list of “Position”. Click the OK button to apply the settings and go back to the main interface. Please see it in the following snapshot. Please click the button Convert to PDF And Save As at bottom of the main interface. In the opened “Browse for Folder” dialog box, please specify an output folder and click the OK button to save the created PDF files. Please see the effects from the following snapshots. Note: The trial version will leave watermarks on the created PDF file and only can be used for limited times. 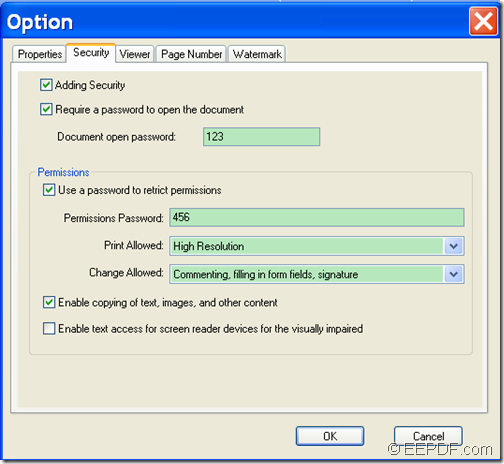 To eliminate these limitations, please buy the full version of EEPDF Office to PDF Converter. The Windows application EEPDF Office to PDF Converter allows you to convert Office Excel (XLS, XLSX) to PDF and encrypt PDF with open password which prevents unauthorized users to open it and permission password that protects the PDF from editing, copying, printing, etc. In the following contents, you will see how to use this application to convert an Office Excel to encrypted PDF. 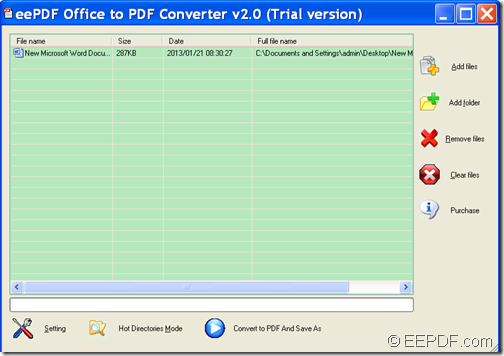 At first, please download the installer of EEPDF Office to PDF Converter. Then, please double click the installer and follow the installation setup to install it on the computer. During the installation, please create a shortcut on the desktop for your use convenience. After you open this software, you can add the Excel file by clicking the Add files button on the main interface to open file picker window in which you are able to add files. To delete the added files in the file list, you can click the Remove files button to delete the selected files or click the Clear files button to remove all the files in the file list. Please see it in the following snapshot. To encrypt the created PDF with open password and permission password, please click the Setting button in the bottom toolbar of the main interface. In the popup “Option” window, you can see five tabs on top of the window. Please click the Security tab to switch to the “Security” panel. Then, please check the radio button of “Adding Security” to activate the rest part on the panel. To set open password, please check the radio button of “Require a password to open the document” and then input the open password in the “Document open password” edit box. 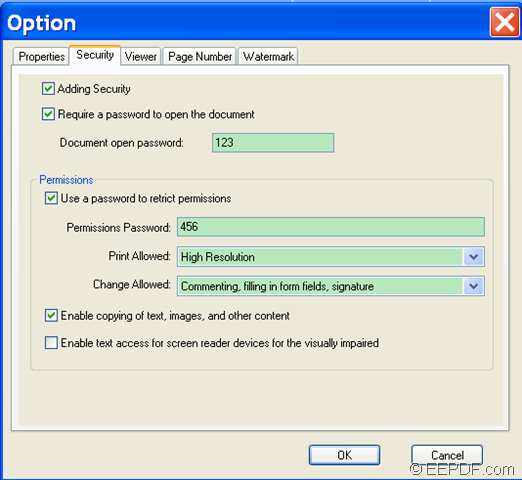 To set permission password, please check the radio button of “Use a password to restrict permissions” and then input the permission password in the “Permission password”edit box. Please see it in the next snapshot. After the encryption, please click the OK button at bottom of the “Security” panel to enact the encryption and go back to the main interface. To convert the Office Excel file to PDF document, please click the Convert to PDF And Save As button in the bottom toolbar of the main interface. When the “Browse for Folder” saving window appears, you need to select a folder and click the OK button on the saving window to save the PDF document. Several seconds later, you can get the encrypted PDF file in the location you specify. With the help of GUI application EEPDF Office to PDF Converter, you can convert Office Word (DOCX/DOC) to PDF and set PDF information. EEPDF Office to PDF Converter is powerful application that can convert various Office file formats including Word (DOC, DOCX), Excel (XLS, XLSX), PowerPoint (PPT, PPTX), RTF, etc. to PDF. What’s more, it supports to set PDF properties such as title, subject, keywords, author, creator, and producer. 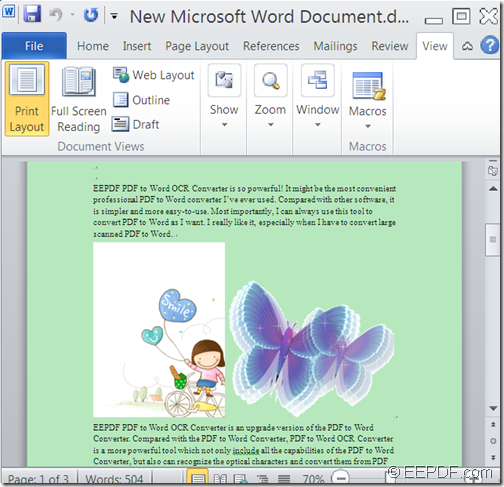 The following contents will site the example of convert a Word document to PDF to show you how to create PDF from Office Word (DOCX/DOC) and set PDF properties. 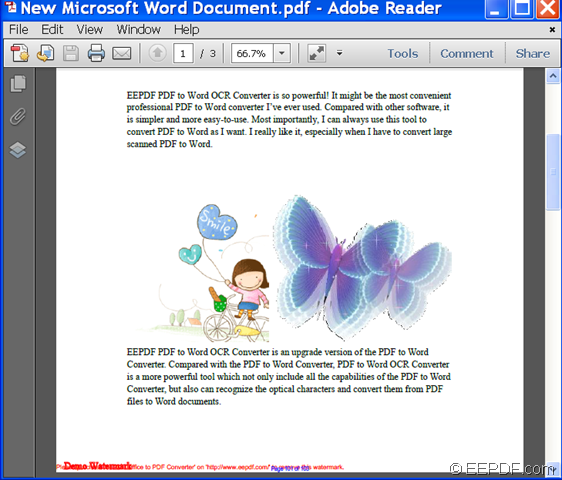 Please download EEPDF Office to PDF Converter and install it on the computer. It’s quite easy to install this smart application. You just need to double click the downloaded file and follow the setup wizard. After the installation, please double click the shortcut icon on the desktop to launch it and you can see its main interface on the screen. Please see it in the following snapshot. This application supports the following three methods to add the Word file into the application. Directly drag and drop the Word file into the processing file list. Click the button Add files on the right side of the main interface to open file picker window in which you can choose files. Click the button Add folder below the Add files button to open a folder in which all the files you want to convert are in the folder. 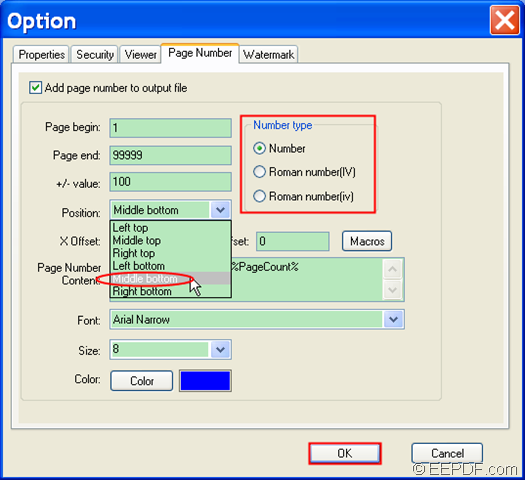 To set PDF information, please click the button Setting at bottom of the main interface to open the “Option” window in which you can make settings for the converted PDF. Then, please click the tab Properties at the top of the opened “Option” window to switch to the “properties” panel. The following snapshot is from the “properties” panel. On this panel, you can set producer, creator, title, subject, author and keywords for the output PDF by directly inputting contents in the corresponding edit box. After the settings, please click the OK button at bottom of the panel to apply the settings and go back to the main interface. 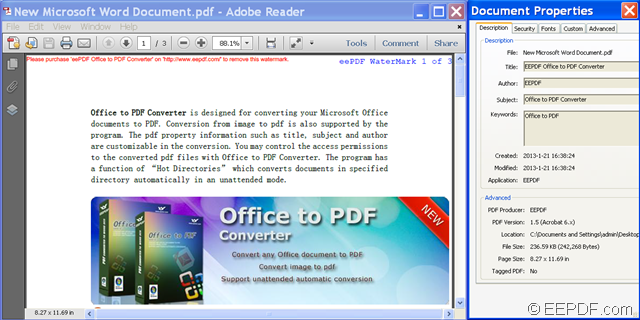 To convert the Office Word file to PDF document, please click the button Convert to PDF And Save As at bottom of the main interface. In the pop-up “Browse for Folder”dialog box, please choose a folder to save the converted PDF document. Note: The trial version will leave watermarks on the converted PDF file. 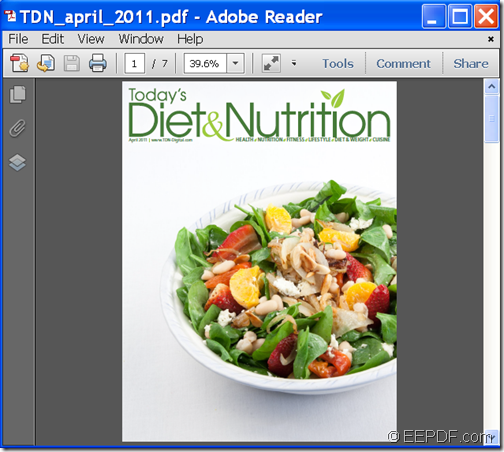 To remove these watermarks, please buy the full version of EEPDF Office to PDF Converter. Do you want to convert a page from a PDF to JPG image of high image quality so that you can insert it into your PowerPoint presentation? If so, please have a try of EEPDF PDF to Image Converter which can help you convert PDF to image of good quality with easy operations. PDF (Portable Document Format) is a great file format that can bundle text and image documents together and preserve the original elements the same on different platforms and operating systems. However, if you need to pull a page from a PDF to insert into your PowerPoint presentation, converting the PDF to a JPG image can be very useful. 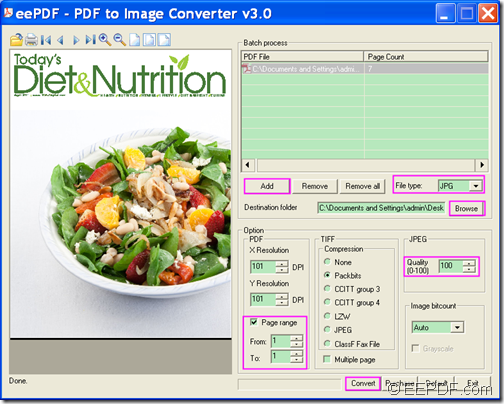 With the help of EEPDF PDF to Image Converter, you can convert PDF to various image formats such as JPG, PNG, BMP, GIF, TIF, TGA, RAS, PCX, EMF and WMF. What’s more, it allows you to set image quality, image resolution, color depth, etc. for the created images. In the following contents, you will see how to use this tool to convert a specific page from a PDF to a JPG image and set image quality. At first, please download the installer of EEPDF PDF to Image Converter. Then, please double click the installer and follow the setup wizard to run it on the computer. After you run this software, you can see its user interface on the screen. Then, please click the button Add below the file list to open file picker window and choose PDF file in the window. To preview the added PDF file, please click on the added PDF in the file list. 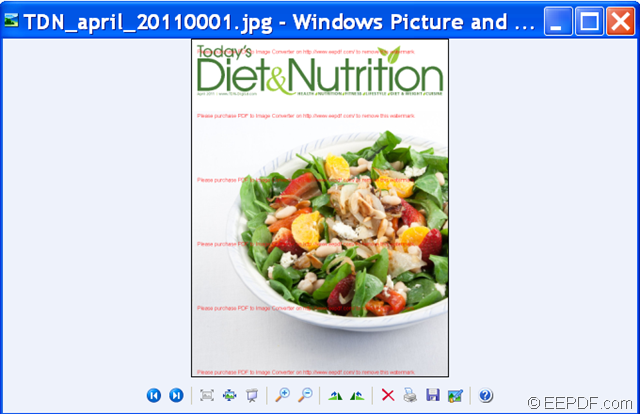 To convert the PDF document to JPG image, please choose the output format as JPG in the drop-down list of “File type”. To choose a folder to save the converted JPG image, please click the Browse button beside the “Destination folder” edit box. Please check the radio button of “Page range” and input the page number you want to convert into the two edit boxes beside “From” and “To” floating buttons. (In this case, we input page 1.) To set JPG quality, please input a number (between 0 and 100) into the edit box beside “Quality (0-100)” floating button within the “JPEG” panel. Please click the button Convert at bottom of the user interface to start the conversion. Several seconds later, you can get the JPG image in the specified location. 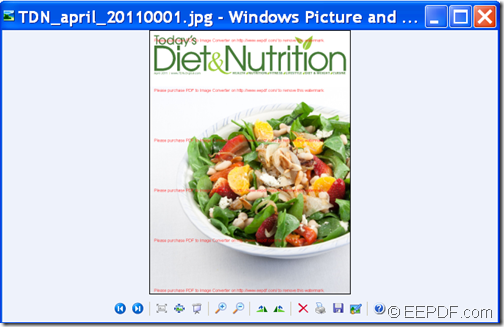 In the following snapshot, you can see the original PDF document and JPG image. Note: The trial version will leave some watermarks on the created image. 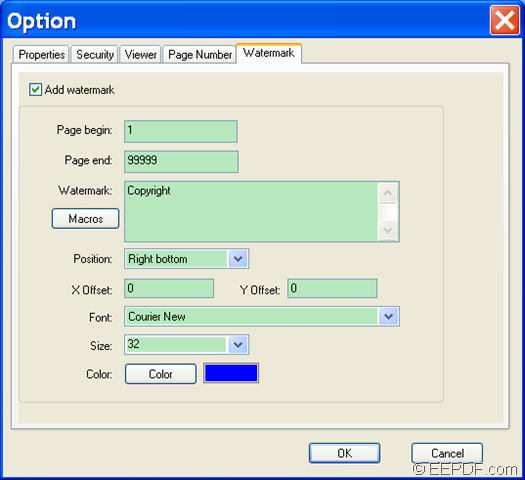 To eliminate this limitation, please buy the full version of EEPDF PDF to Image Converter .